This topic contains 35 replies, has 21 voices, and was last updated by Lance 1 month ago. (Still) got you a guy who can do both. After another long, unintended hiatus, I decided to pull up Recon the other day and see if I still got the moves. Not to brag, but it looks like I only got better. Two missions with ≥50% coverage. Looks like my tactical FPS sessions seem to have payed off. Thanks, Tom Clancy! days of relentless walking and destroying trenches and camp sites (plus one culvert), but the results were splendid nevertheless. Dealt a good blow to their war effort. This here was from just now. I’m quite proud. Really more luck than anything. But Silent Ops, man. I’ve been trying to get it for a while now. This is a grand moment for me. Hold my hand. This reply was modified 1 year, 11 months ago by FieldsOfFire. 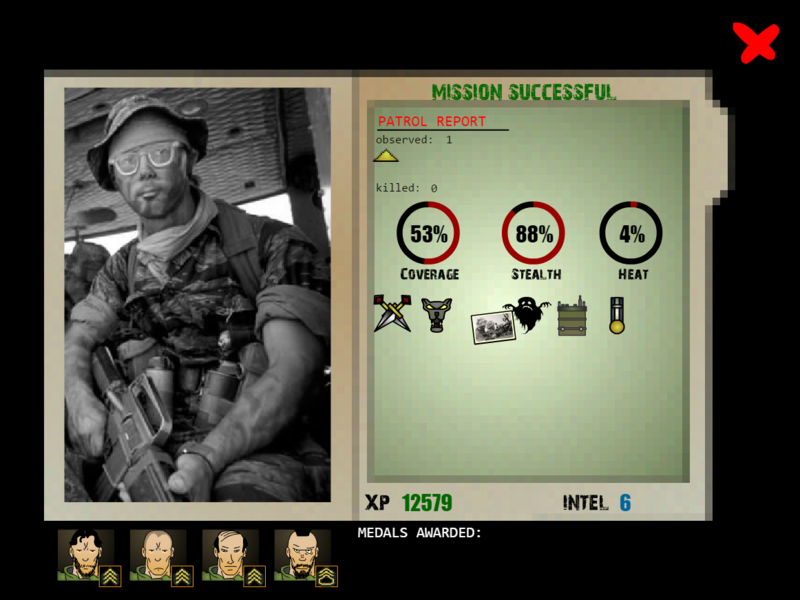 Haven’t played recon in over six months. Yesterday I had a pretty good mission, which I’m trying to find the AAR for. I’ll maybe post a story with it later, but I’m heading out to find and defend a firebase, wish me luck! This reply was modified 1 year, 10 months ago by CommanderPanzer. Cool result, but if you take a look at the previous posts, they usually say HOW was it achieved. Because, ya’ know; the whole AAR thing is not about the result but about conduct of a patrol. Just saying for ruture notice. Another detailed AAR, full of nervous sensor clicking, slow prisoner dragging and with a solid dose of URB at the end. Aslo, sorry for double post, but it’s entirely different matter, so I didn’t want to edit that in. No intel on readiness or devices in the AO. C3 – 6:00 -On the ground. Insert report. C3 – 6:30 – Signal check: 20% at LZ. Strength increasing towards north. C3 – 8:00 – Squad moving north. Vietnamese voices heard up ahead. C3 – 8:15 – Taken cover in the bushes. Deployed ground sensor. 5 movers detected. C3 – 8:30 – Enemy engaged in HTH combat in the bush. Taking fire from unknown direction. Weapons free. C3/B3 – 9:00 – 2 enemies killed. No one on the squad is injured. Sensor shows no further contacts. No intel on the bodies. C3/B3 – 9:15 – Signal check: 37%. Team 45% towards insertion. B3/B4 – 9:45 – Signal getting stronger to the East. 45% strength. Squad found tracks leading East. B4 – 10:15 – Squad is covert. Moving east. Found a pressure mine. Investigation of second track revealed that it was left by a single enemy. B4 – 11:00 – Signal strength 70%. Team 70% to insertion. B4/B5 – 12:00 – Enemy spotted to the East. Local force, looking north. B4/B5 – 12:15 – Enemy succesfully snatched by U. Hawke. Team 95% to insert. signal strenght 87%. B5 – 13:00 – Squad found a 100% Signal strenght spot. Setting up all around defense with claymores and sensors. B5 – 13:10 – RTX successfull. Making a sitrep: 45% covert. 8% AO receed. contact rep: 2 spotted. 2 engaged. 13 rounds used. Switching back to RTX. B5 – 13:30 – Vietnamese voices heard around the area. Outside of sensor range. B5 – 13:45 – Deep Operating Team requested Evac. Granted. Retransmission complete. Mission accomplished. B5 – 14:00 – Moving south, to sweep around the AO and head back to LZ. Requested Bird dog overflight. Granted. B5/C4 – 15:15 – Bird dog reported UXO at A2 with 1 enemy nearby. The plan is as follows: Squad will move and secure the LZ. Then, U Hawke and S. Alvarez are going to stay at the LZ, while N.Moncayo and X.Briggs scout photograph and destroy the UXO and go right back. C4/B5 – 15:50 – enemy straw hat spotted. Squad took cover and avoided detection. Enemy went North-West. C4 – 19:10 – 2 enemies spotted to the north, right next to the dense bushes where squad was attacke in the morning. They seem to be investigating the tracks left by team. Luckily, the lead north, away from current position of the Squad. S.Alvarez suggests planting a Claymore at the position of the tracks to ambush the enemy. C3 – 20:45 – Squad arrived at LZ from the East. They will circle around the LZ, set up position to the south, wait out the night and then continue with the plan. C3 – 21:00 – Darkness falls. Sitrep: 74% covert, 10% AO receed. C3 – 22:00 – Enemy spotted. Regional. Heading East. Squad remained undetected. N.Moncayo followed the enemy with an intend of knife takedown but couldn’t keep up with the enemy while trying to remain undetected. C3/D3 – 23:00 – Squad made it to secured position to the south of LZ. Surrounded by dense bushes and overlooking the LZ. Deployed sensor. 1 mover detected. C3/D3 – 1:15 – Enemy spotted to the West, strolling along the bushline. Passed the Squad’s position and turned back north. After a while left the range of the sensor. C3/D3- 2:00 – Contact rep: 5 identified, 2 neutralized. scanner picked up a contact. C3/D3 – 3:30 – Another enemy enterd the scanning range. 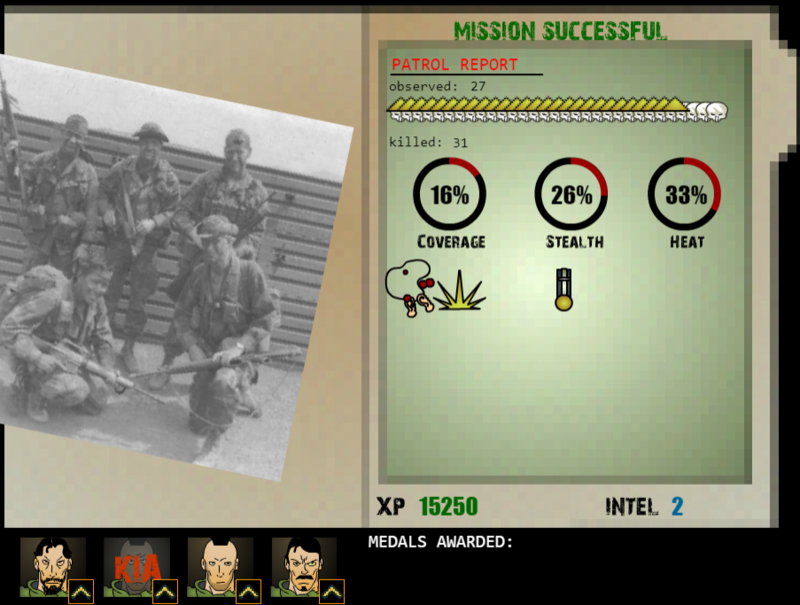 C3/D3 – 4:15 – The same guy as before wondered right across the team’s position, luckily didn’t spot anybody nor heard the choking VC still held by U.Hawke. At the same time a straw hat was spotted to the North-East, but turned around and walked away. C3/D3 – 4:30 – No contact on the scanner. C3/D3 – 6:00 – Daybreak. Sensor picked up 1 contact. C3/D3 – 7:00 – No contact on sensor. S. Alvarez stays at the observation post with U.Hawke. Sarge and RTO move West to investigate the UXO. C3/D3 – 12:00 – 1 contact on sensor. S.Alvarez spots the enemy moving across the LZ. B2/A2 – 13:00 – Vietnamese voices heard up ahead. A2 – 14:25 – UXO Spotted. No visaul on any of the enemies. A2 – 14:45 – While moving to position to observe the UXO, X.Briggs triggered a flare trap. N. Moncayo tossed a grenade at the bomb, detonating it but got hit by a shrapnel and fell down incapacitated. X. Briggs spotted an enemy nearby and threw one of Namcayo’s grenades at him, killing him instantly. He then tried to stablilise the Sarge with his bandages, but failed three times in a row, so he tried using Sarge’s IV’s. Unfortunately, they were all depleted, despite not being used. With no other choice, he grabbed a Sarge and started moving towards the LZ, hoping to make it in time. C3/D3 – 17:00 – Enemy activity around the obesravtion post. Alvarez and Hawke once again managed to avoid detection. B3 – 18:35 – X. Briggs carries the bleeding out sargeant to the LZ. Calls for Evac. The anwser is incomprehensible. Spots one enemy on the way. Remains unspotted himself. B3 – 19:15 – X. Briggs calls for another EVAC. Granted: ETA 28min. A5 – 19:45 – Evacuation helicopter enters the AO. 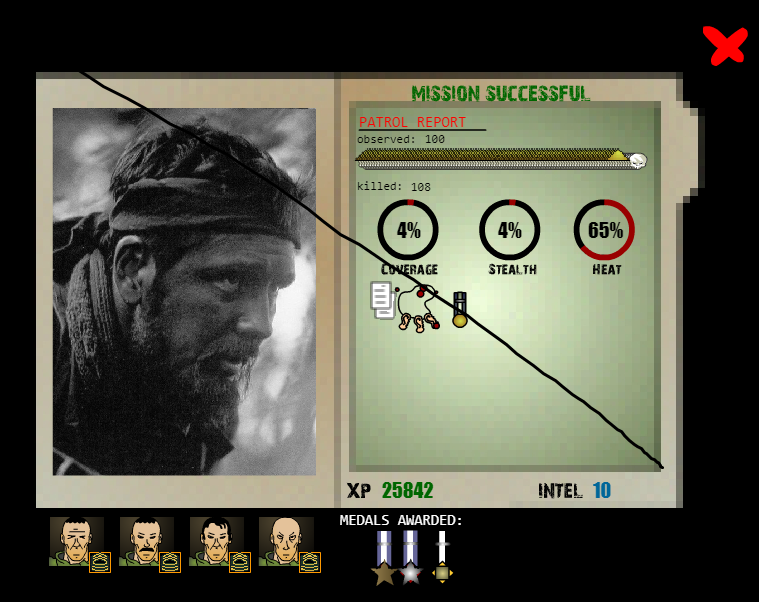 B3 – 19:45 – X.Briggs confirms that Sarge is still alive, but in critical condition. C3 – 19:45 – S. Alvarez leaves the observation post and moves to the middle of LZ, weapon ready. U. Hawke followed him, struggling to hold the prisoner. C3 – 19:55 – Helicopter takes fire on apporach to Lz. C3 – 20:15 – Helicopter lands. S. Alvarez refuses to board before X.Briggs and Sarge arrive. C3 – 20:35 – X.Briggs can be seen emerging from the tree line and moving towards the awaiting Huey and rest of the Squad. C3 – 21:15 – X. Briggs arrives and boards the helicopter together with Stg. Namcayo. Helicopter takes fire from the tree line. Pilot panics and takes off, before S. Alvarez or U. Hawke can board it. Realising it, Briggs orders the pilot to go back, but is ignored. He also tries to call in another helicopter from the board of the Huey, but receives negative anwser. C3 – 21:20 – U Hawke executes a prisoner with his sidearm, grabs his M16 and stands back to back with Cpl. Alvarez. Alvarez kills one VC who rushed across the LZ. More voices are heard from the surrounding jungle. Huey takes more ground fire on it’s way out. X. Briggs demands the pilot to go back for the rest of the squad or call in another evacuation helicopter, but is told that it’s impossible due to increasing enemy presence in the AO. D1 – 21:25 – Helicopter leaves the AO. Upon returning to base, N.Namcayo received immediate medical attention as well as a purple heart. Corporal Alvarez and Private Hawkes are deemed MIA. No rescue mission has been authorized. Mission was considered a success, despite heavy losses. Later that day, Lieutenant Kacpo, commanding officer of Ranger team in this area, received a memo informing about a double agent in the ranks of ARVN, who relayed all the intel to the Soviet agents in the NVA. Due to this, all 39 of the intelligence data recovered by the Rangers had to be discarded. However, before that, Lt. briefed his squad, letting them know about recent actions of the enemy, and where to operate to minimize the enemy contact. After that, proceeded to destroy the rest of the intelligence data. This reply was modified 1 year, 4 months ago by Kacpo. I had a very good read for sure. Thanks for writing this. So well made it feels like an actual army AAR. Good stuff man. I may not have the most detailed description, but I think this is worthy of more than a discord upload. 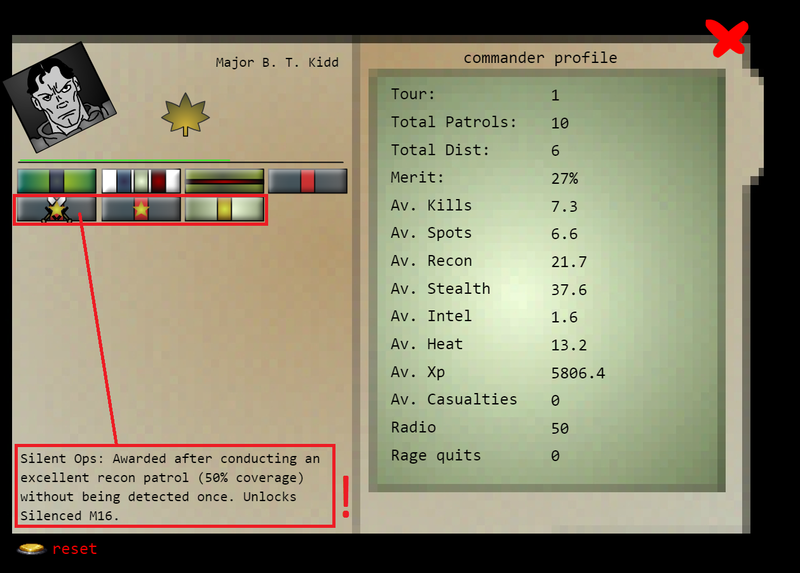 This is my first attempt of an AAR for Mud and Blood: Recon, though I’ve played it for quite some time. Although I don’t think it’ll be up to par for some of the AAR I’ve seen so far, I think it’s an interesting one none the less. I didn’t write down every detail that happened, but I’ve put in everything that I’ve acquired through notes. Additional notes: Intel had to be scrapped prior to this Operation due to a breach in security. Squad is going in blind. C3 0800: Alpha one two dismounts at LZ. Some garbage is spotted directly North near the LZ. A full perimeter is set up South of C3 in some bushes. C3 0830: 1 hostile is spotted heading towards the LZ, directly West of Alpha one two. Sight is soon lost. Cpl. Sanchez calls in Bird Dog to scope the area. C3 0900: Bird Dog reports a patrol trail at A3, with 0 hostiles nearby. Alpha one two proceeds to head North to locate the trail. C3 1100: Alpha one two investigates the pile of garbage located North of C3, but finds no Intel. After confirming no Intel in the garbage, Alpha one two comes under fire by 2 hostile contacts South of their location. Contacts are neutralized and no injuries are sustained. B3 1730: While slowly advancing towards A3, Cpl. Peter spots a pressure mine that Sgt. Sergey just walked over. Alpha one two carefully moves West away from the mine while setting up another perimeter in some trees. B3 1815: Multiple voices are heard near Alpha one two’s position, presumable coming from the North. Positioned is held until Alpha one two has eyes on hostiles. B3 1900: 4 hostile sappers (Dac Cong) are spotted checking up on the previous located trap. Alpha one two engages and neutralizes all four contacts while taking no injuries. 1 frag expended. Mission objective is achieved. Alpha one two continues towards reported trail. A3 2200: While sweeping the Eastern part of A3, voices are heard near Alpha one two. A tight perimeter is set up in some dense forest. A3 2315: A patrol is spotted North East and North West of Alpha one two, danger close. Patrol is engaged, and 4 contacts are neutralized. 1 frag expended. Forces appear to be NVA troops. Voices can still heard nearby. Alpha one two holds position. A3 2400: 4 more NVA troops are spotted advancing on Alpha one two’s position from the South, South West, and East. Contacts are neutralized. No injuries sustained. Alpha one two decides to wait till daylight to continue the search for the trail. A3 0700: More voices can be heard near Alpha one two’s position. Alpha one two holds position. A3 0715: A large group of militia are spotted all around Alpha one two’s position, estimated to be section sized. Alpha one two is forced to engage. 4 contacts are neutralized. 2 frags expended. A3 0745: 3 other contacts are neutralized by Alpha one two. Pvt. Adams was killed by a shotgunner at close range. Alpha one two is abandoning the trail. Proceeding South towards LZ for Evac. Sgt. Sergey is carrying Pvt. Adams. B3 1030: Alpha one two comes under fire by Regional Garrison skirmishers South of their position while proceeding towards Evac. 5 contacts neutralized. No injures sustained. B3 1315: Alpha one two engages 2 Regional forces spotted inside the LZ. All contacts neutralized. No injuries sustained. C3 1400: Alpha one two reaches the LZ. A perimeter is set up North of the LZ inside some trees. Cpl. Sanchez calls for an immediate Evac, but is denied due to the area being too hot. C3 1445: Some voices can be heard around Alpha one two’s position coming from the North, North East, and West. Alpha one two holds position. C3 1500: Cpl. Sanchez contacts Command again to request for an immediate Evac, but fails to get a connection. Alpha one two engages Militia advancing on their position. Neutralized 1 contact. 2 other contacts retreated and their current positions are unknown. Radio battery is at 47%. Ammo running low. C3 1600: Cpl. Sanchez continues to call for Evac, but is either denied or fails to make contact. More voices can now be heard all around Alpha one two’s position, but are currently unseen. C3 1815: Cpl. Sanchez successfully calls for an Evac at the LZ. More hostiles are engaged. Position is being swarmed. 4 hostiles neutralized. Hostiles appear to be a mix of Militia and Regional forces. Shouting can be heard all around Alpha one two’s position. Estimated strength of hostile forces; Platoon. Ammo running dangerously low. C3 1900: Evac finally arrives with the door gunners immediately opening up. Alpha one two makes a break for the helicopter. Cpl. Sanchez and Cpl. Peter cover Sgt. Sergey as he carries Pvt. Adams to the helicopter. Engagement ranges are as close as 15 feet. All squad members are successfully loaded in and accounted for. 2 contacts are neutralized. C3 1915: Evac proceeds to head South West to leave the AO. Helicopter is under heavy small arms fire from multiple positions. The door gunners continue to open fire at anything they see, but fail to inflict any casualties. E1 1945: Evac successfully leaves the AO. Helicopter has taken moderate damage. 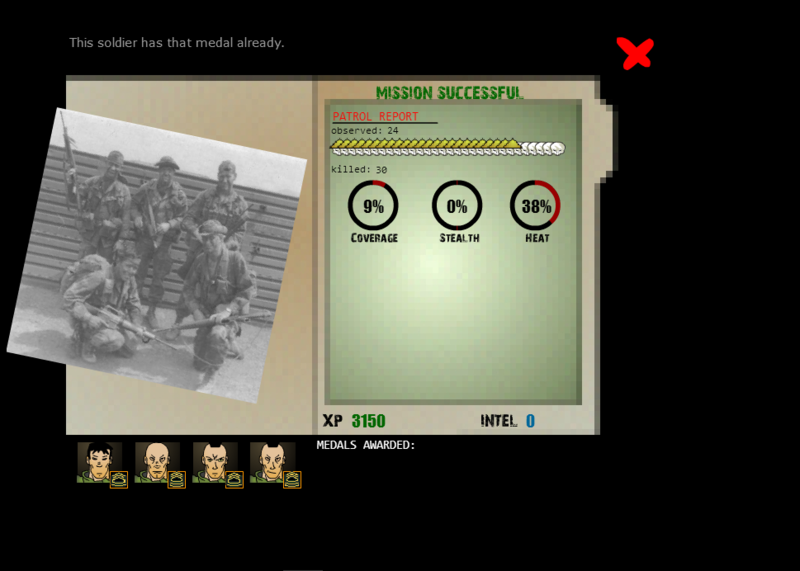 After Operation Northern Force, 1st Lieutenant Jerico was reported by Lieutenant Colonel I. Wilson for causing Alpha one two to take unnecessary casualties. Lieutenant Jerico is now being reviewed by High Command and is likely to lose any chance he has acquired to be redeployed again in his next tour as of January 24th, 1969, though future operations may redeem him. 40+ contacts on 10% heat? That’s rough. I’ve never had such encounter. That’s a very well done AAR. The beauty of this is that it reads and sounds exactly like many real life AAR I’ve read from Rangers working on the trail when researching about Recon. That is probably the most rewarding feeling I get from this game and its community. Recon is not perfect but it nails the operational details and the mechanics of patrolling behind enemy lines in a very unique way. It creates emergent experiences that can be recounted as if you were there never two patrols are the same. Thank you for this AAR and thanks for being crazy enough to take the time to learn and playing Recon. This reply was modified 1 year ago by urbzz. Both of these were hunter/killer missions, and in each one I found a tree or two in a field without any others and positioned my guys there. Didn’t have to use air support or a grenade to draw them in, as these were insertions with high enough heat to get a few early kills and attract the QRF. This reply was modified 1 year ago by Top12Gun. -weather is dry. Hopefully not hot. D3 – 0815 – Taking fire from north-east. Single red-bandana spotted. D3 – 0820 – WPS free. Enemy down. D3/4 – 0830 – Body searched by G. Bullock. no intel. proceeding south. E3/4 – 0915 – squad is covert. rotating West in attempt to cover the most ground before nightfall. E3 – 1000 – Q. Draper spotted a mine right in front of him. took a picture with a camera. E2/3 – 1110 – P. Tucson reports noise from up ahead. E2 – 1200 – Q. Draper fell into punji stick trap. No vital signs. E2 – 1300 – E. Smith carries Draper. Squad makes a turn north, in order to reach the LZ. D2 – 1400 – Voices heard up ahead. C3 – 1700 – Squad has made it to the immediate surroundings of the LZ. Body of Q. Draper was left in some bushes nearby. C3 – 1715 – rest of the team proceeds to North-East in an attempt to cover more ground before extraction. C3 – 1800 – Time check: half of the time remaining. C3 – 0000 – Time check: Midnight. Squad has made it to the LZ. C3 – 0300 – Evac arriving in 3 hours. Team is setting up all-around on the LZ. C3 – 0400 – Body of Q. Draper is brought to the LZ by E. Smith and prepared for extraction. C3 – 0600 – Daybreak. A helicopter is heard entering the AO. P. Tucson deployed smoke grenade on team’s position. C3 – 0700 – Helicopter touches the ground. Team immediatedly boards it and takes off. light ground fire on the way out. D1 – 0800 – Extraction helicopter leaves the AO. 11th successfull mission in the row. 320 days of Tour 1 Left. C-3 6:00 Squad landed in the LZ. C-3 6:00 Insert report. No contact on landing. 1 Pressure mine spotted. Signal strength at 8%. C-3 7:00 Choppers left the AO. Squad turned eastwards, since the signal strength has dropped to 7% while moving north. B-2 9:00 contact. 1 VC from local militia spotted, west of team’s position, moving sounth. Squad remained unspotted. A-2 12:15 Squad located a spot with 100% signal strength. preparing All around defence and deploying ground sensors. Team 75% to insertion. A-2 14:00 Team on the ground. Begining retransmission. A-2 19:00 time check, 2 hours of sunlight left. A-2 19:15 team requested extraction. Retransmission complete. Requested Bird Dog overflight. A-2 20:00 Bird Dog reported vechicle trail at D-3 with 1 hostile around. A-2 21:00 night has fallen. Squad is taking a knee and setting up all around defens for the night. At dawn they will move out and investigate a track reported by Bird Dog. A-2 00:00 time check: midninght. no contacts. sent contact report. A-2 6:00 Day break. Squad moving out, south. B-12 6:00 Contact. A single local VC spotted to the south west. C-12 9:15 P.Tucsan triggered a flare trap. Squad breaks off south to avoid contact with any VC that may come to investigate. D-12 11:00 Covert. Squad proceeding East in search for tracks. D-23 12:45 R. Church triggered a flare trap. Squad taking cover and setting up all around defence in nearby ruins. D-3 13:00 R.Elliot spotted tracks left by heavy vechicle. No sign of enemy. D-3 15:00 squad moving north, to extract. contact with the enemy, WPS free. enemy down. no casualties. Search revealed nothing of interest. C-3 15:15 called in extraction. ETA 20min. C-3 16:00 squad avaiting at Lz. Choppers closing in. Bird dog reported enemy closing in from the north. C-3 16:15 squad boarded the Huey. C-3 16:45 chopper left the AO. 13th successfull mission in a row. This reply was modified 4 months, 4 weeks ago by Kacpo. Just got selected to go on my first patrol as a ranger! I am replacing the demo man for an squad that lost theirs. I am sitting in the Debriefing with the squad I will be patrolling there is Sergeant G. Hook the medic with 6 patrols, 23 confirmed kills has saved 5 rangers. Then there is First Sergeant G. Draper the RTO with 37 patrols and 170 confirmed kills ans supposedly the best RTO in nam. Lastly First Sergeant T. Jefferson with 34 with over 300 confirmed kills and is a green beret! So the mission is to find an old firebase and take out the VC and then after we evac the marines will take care of the rest the others say its an easy mission. Seems like Hook and Jefferson are using the m14 and Draper is using a Stoner 63. We just landed moments ago we are taking a tactical pause it doesnt seem like we are being followed. Jefferson is leading the way he walks through the jungle like he owns it. After an hour of nothing happening we spotted the Firebase and about 10-15 NVA we moved to an area hidden by trees and shrubs and are waiting for night fall Jefferson just left the group and said will be back shortly. 1 hour has passed and we can just hear the NVA talking to each other in the firebase I wish I took the Vietnamese class they offered. Draper says they are talking about Lunch plans and about our Hueys that brought us in. A few more hours have passed and Jefferson is still gone we havent moved an inch since. Shots fired and we are moving to attack the Firebase! When T. Jefferson left the group he scouted part of the A.O. and found a small village he talked to the people and one of them agreed to fight with the rangers and be brought back to the camp. Upon returning to the group the Villager was spotted by one a VC militia man and fired upon him. T. Jefferson opened fire on the militia man killing him with two shots to the chest. They where 200 feet from the Firebase when this occurred Hook and Draper took that as the signal to attack the firebase. At this time Jefferson aproched the firebase killing three NVA troops the group of three rangers attacked from the north while Jefferson attacked from the East. They quickly killed all of the NVA holding the fire base when aprox 5 NVA approached from the south west and fired a shot injuring G. Draper. shortly after the incapacitated G. Hook and B. Terence. 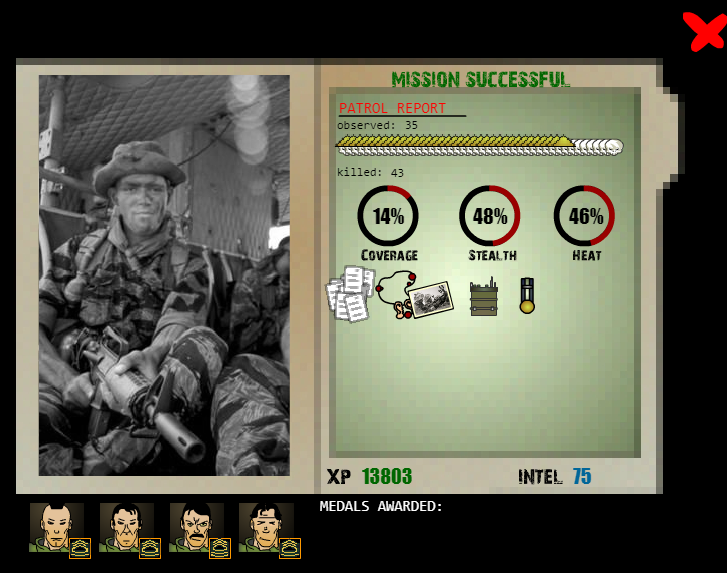 T. Jefferson valiantly acted killing the 5 NVA and calling a secondary evac at the firebase. Jefferson then proceeded to stabilize the incapacitated rangers the Huey took 50 minutes to arrive giving enough time for G. Draper to bleed out. The Huey is 1 minute out and Jefferson marks the LZ with a WP grenade and carries G. Hook to the LZ he then grabs G. Draper who unknown to him was KIA at this time. The Huey lands and the villager jumps aboard and the huey crew pickup G. Hook. Jefferson Carrying G. Draper jumps on the Huey and goes to get PVT. B. Terence when the huey takes fire and takes off. Jefferson Furious that they were leaving PVT. Terence behind tells the pilot to put the huey back down at this point they are taking heavy fire from multiple automatic weapons and a HMG. the pilot cant land the huey due high risk of losing the huey and everyone aboard.